1Department of Pharmacology, Faculty of Pharmacy, Sri Ramachandra University, Porur, Chennai – 600 116, Tamil Nadu, INDIA. 2Department of Pharmacology, Mother Theresa Post Graduate and Research Institute of Health Sciences, Puducherry - 605006, INDIA. 3Department of Pharmacology, Faculty of Pharmacy, Sri Ramachandra University, Porur, Chennai – 600 116, Tamil Nadu, INDIA. 4Department of Pharmaceutical chemistry, Faculty of Pharmacy, Sri Ramachandra University, Porur, Chennai – 600 116, Tamil Nadu, INDIA. Background: Psychological problem is a key medical issue for numerous neuropsychiatric and neurodegenerative diseases, for example, schizophrenia, Alzheimer’s, dementia, seizure and Parkinsonism. Morinda citrifolia (Noni) has been utilized for a considerable length of time to cure or counteract assortment of diseases by conventional therapeutic professionals in Hawaii and Polynesia. Objective: The present study is focused to identify the neuroprotective activity of Morinda citrifolia fruit extract (MCFE) on in vitro and ex vivo animal model by inhibition of acetylcholinesterase (AChE), an enzyme target used for the treatment of Alzheimer’s disease. Methods: Acetylcholinesterase inhibition assay was performed by in vitro & ex vivo methods as described by Ellman et al. In vitro antioxidant assay of the extract was performed by DPPH free radical scavenging activity & nitric oxide scavenging activity. Statistical analysis used: Statistical analysis was carried out using non linear regression analysis for plotting the line of best fit for the observed values using Graph- Pad Prism software. Results: By performing in vitro antioxidant assay the IC50 value of the standard quercetin was found to be 46.22 μg/ml as compared to the MCFE which has an IC50 value of 43.14 μg/ml for DPPH free radical scavenging activity. Similarly the IC50 value of the standard ascorbic acid was found to be 81.85 μg/ml as compared to the MCFE which has an IC50 value of 148.0 μg/ml for nitric oxide scavenging activity. 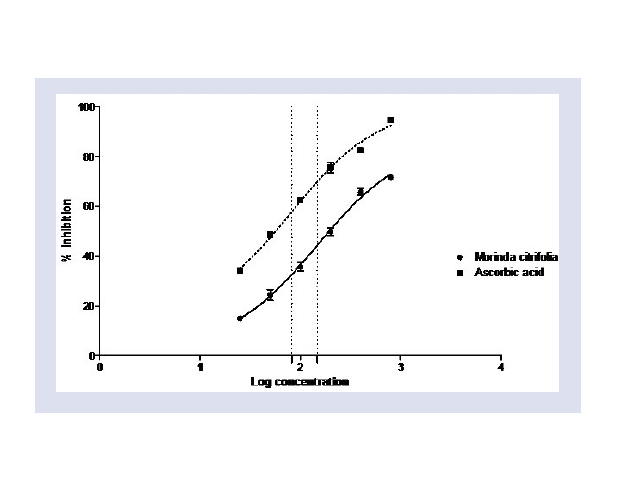 Acetylcholinesterase inhibition assay was performed by in vitro method and the IC50 value of MCFE and neostigmine was found to be 31.84 μg/ml & 19.71 μg/ml respectively. Conclusions: The present study investigated the neuroprotective activity of MCFE and it was identified by both in vitro and ex vivo techniques that the phytoconstituents has the ability to improve the learning and memory function by inhibiting the acetylcholinesterase. Jeyabalan S, Subramanian K, Cheekala UM, Krishnan C. In vitro & ex vivo Acetylcholinesterase Inhibitory Activity of Morinda citrifolia Linn (Noni) Fruit Extract. Pharmacognosy Journal. 2017;9(6):900-905.